Tangy, zesty, and crunchy pickles, easy to make and ready for snacking the very next day! Combine vinegar, water, sugar, coriander seeds, garlic, and salt in a sauce pan. Heat until the sugar dissolves (not until boiling), stirring periodically. Let cool completely. 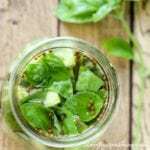 Place some of the jalapeno slices and basil leaves in the jar. Stuff the cucumbers on top. Place the rest of the jalapenos and basil in between and on top of the cucumbers. Pour the vinegar mixture into the jar, covering the cucumbers completely. Store in the refrigerator for 12 hours before serving.